Today has been a long day, I could sit with my blog only now. Though I had taken the resolution to schedule my posts in advance, not to stay up late, it works only for a week and then I am back to square one, I don't know when I am going to be more organized. Well, coming to today's post, Green Tomatoes With Chana Dal, I had picked up these tomatoes from my vegetable vendor, with not the slightest idea of what I am going to do with it. In fact, I think, this is the first time, I even cooked something with it. I made this dal, using bengal gram and also added some fresh coconut paste for some extra flavor, it went well with both rice and rotis.. Grind together all the ingredients given under 'to grind' and keep. 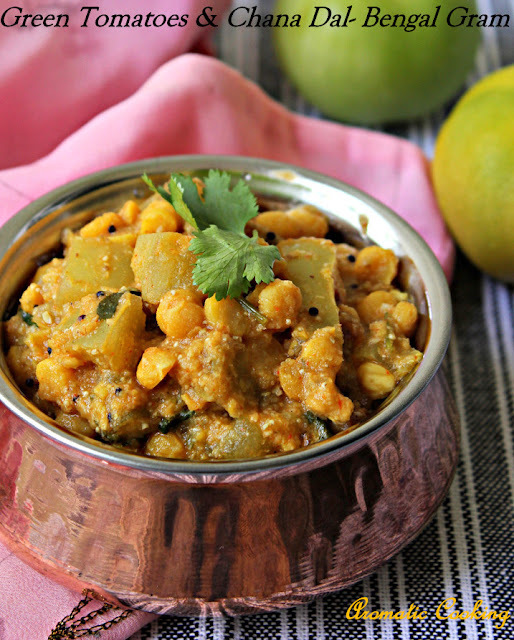 Pressure cook the chana dal with the turmeric powder. Heat some oil, add the mustard and fenugreek seeds, when it starts spluttering add the tomatoes and mix. Add the salt, chilly and coriander powders, mix for a minute. Now add about a cup of water, cover and cook till the tomatoes are done. Now add the cooked dal and the ground paste. Cook for another 3 to 4 minutes. Finally garnish with the curry leaves and the chopped coriander and serve it warm. If you don't have a pressure cooker, soak the dal for an hour and then cook in a regular pot with water. If the tomatoes are too sour then reduce to 1 and a 1/2 cup. Soak the poppy seeds in little hot water for 10 minutes, so that you can grind it smoothly. I have not cooking with green tomato yet.. But this kootu looks so delicious and inviting!! Yum yum yum. The grren tomatoes should taste so good in this curry. I love the tanginess of green tomatoes... Good one. I am posting only twice week, still not finding enough time to post and comment. I admire you to post everyday. 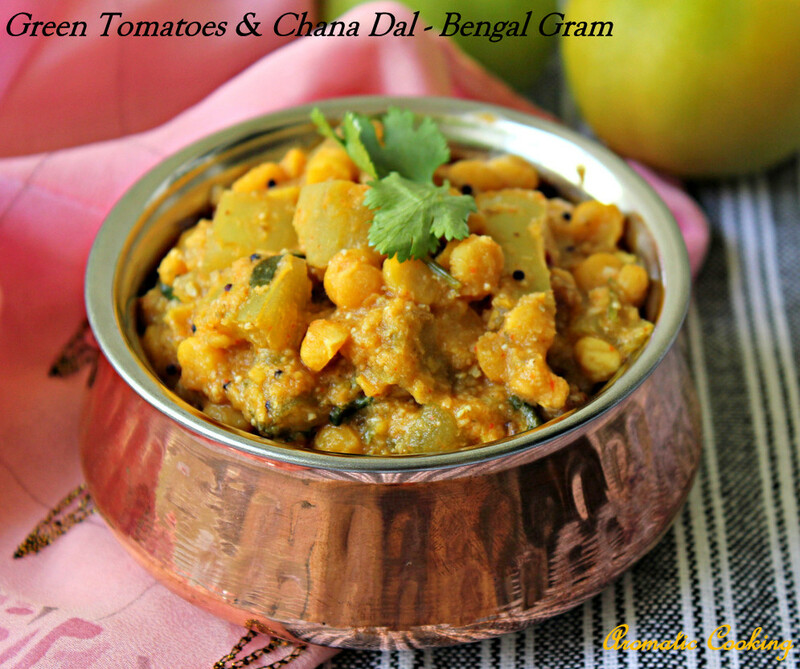 By the way delicious curry with green tomatoes and chana dal. Nice combo resulting in a very yummy curry. Off late I am seeing many recipes with green tomato... Looks yum! i was planning to do this combo too :) nice version hema..